Masters and slaves viewed slave quarters very differently. While masters sought to create an ordered world where their control was complete, slaves attempted to create homes, grow food and raise families. Former slaves describe growing flowers, building furniture, and hanging pictures to make the spaces their own. Though most slave cabins were modest log structures and did not last long past the end of the Civil War, some more substantial structures built of brick, stone, still dot the southern landscape today. This image was made of emancipated slaves in front of their homes shortly after the Union Army captured the South Carolina coastal islands (note the piles of cotton in front). Mary Reynolds' oral history of her life as a Louisiana slave was collected in the 1930s. Once in a while they's give us a li'l piece of Sat'day evenin' to wash out clothes in the branch. We hanged them on the ground in the woods to dry. They was a place to wash clothes from the well, but they was so many [slaves,] all couldn't get round to it on Sundays. When they'd git through with the clothes on Sat'day evenin's the [slaves] which sold they goobers [peanuts] and taters brung fiddles and guitars and come out and play. The others clap they hands and stomp they feet and we young'uns cut a step round. I was plenty biggity and like to cut a step. 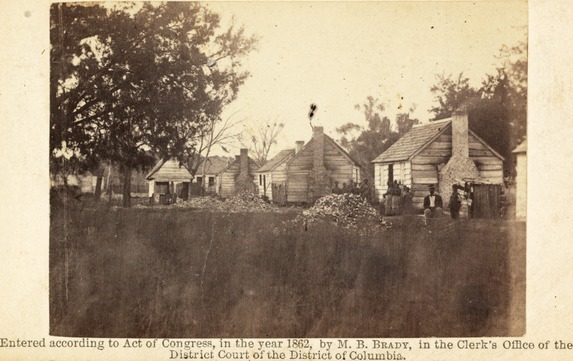 Source | Photograph: [Timothy O'Sullivan for Matthew Brady's studio], [Slave quarters on a plantation, possibly in Beaufort, South Carolina], photograph printed on carte de viste, circa 1862, Library of Congress, http://www.loc.gov/pictures/item/2010647787/. Oral History: Mary Reynolds, Oral History collected by W.P.A. Slave Narratives Project, available from The University of Virginia, http://xroads.virginia.edu/~hyper/wpa/reynold1.html. Cite This document | Timothy O'Sullivan and Mary Reynolds, “A Former Slave Recalls Slave Quarters and Moments of Leisure,” HERB: Resources for Teachers, accessed April 20, 2019, https://herb.ashp.cuny.edu/items/show/1570.